Originally published by Stevenson, Inc., this practical resource features publicity strategies for nonprofit leaders and professionals. It includes techniques and procedures to create awareness, increase visibility, strengthen media relations, and build an organization’s reputation. Many successful publicity ideas are given from a variety of nonprofit organizations, along with tips for gaining greater exposure through a variety of media outlets and channels. Please note that some content featured in the original version of this title has been removed in this published version due to permissions issues. 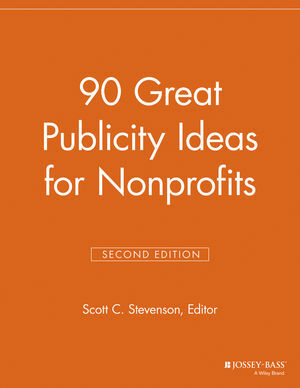 Scott C. Stevenson is the editor of 90 Great Publicity Ideas for Nonprofits, 2nd Edition, published by Wiley.